Recorded live at The Galaxy Theatre in Santa Ana, California on August 13, 2003, LIVE - Going Home captures the original Blasters pouring their hearts out and reminding us all why their brand of punk-fried country-rock helped blast off the genre. Including guest appearances by mentor and legendary Chicago blues musician Billy Boy Arnold, rockabilly icon Sonny Burgess, and West Coast doo wop originals The Calvanes, The Blasters spit out one lively, highly entertaining, unforgettable performance at The Galaxy. Also including vintage footage of the band from the early 80s, performances by the current Blasters line-up, and interviews with each of the Blasters and their special guests. 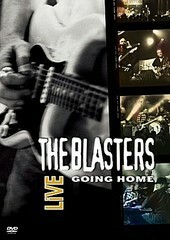 LIVE - Going Home is a document to the magic of August 13, 2003, as well as the illustrious history and legacy of The Blasters. I'll give this an A-.